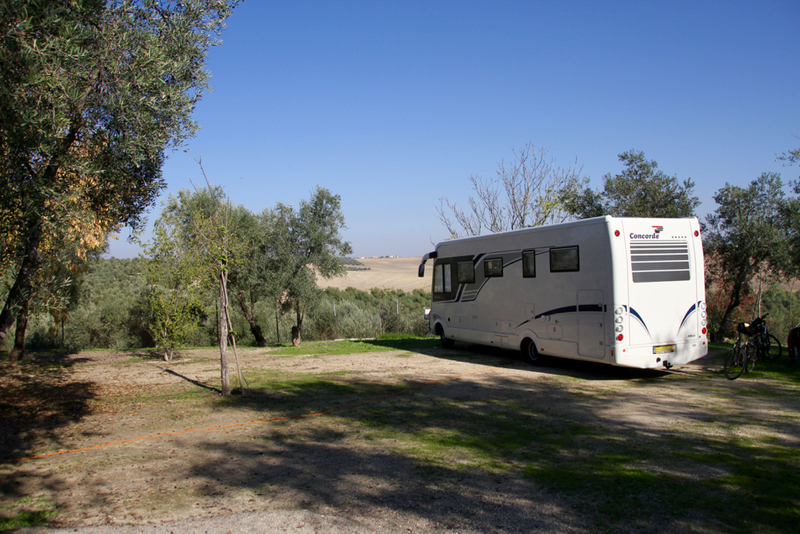 We have discovered the best campsite in Spain…it is La Campiña, a smallish site tucked away in the Andalucian olive groves about 20 miles south of Córdoba. 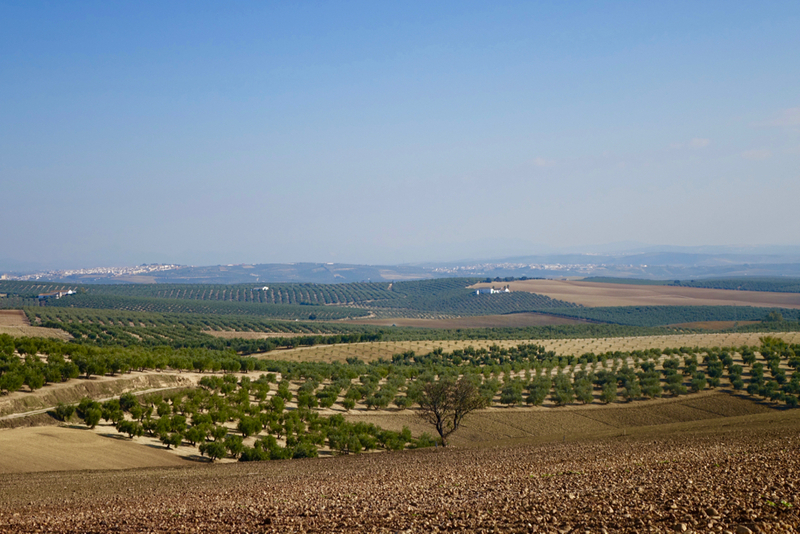 The name La Campiña translates as a region of rolling hills and fertile land. 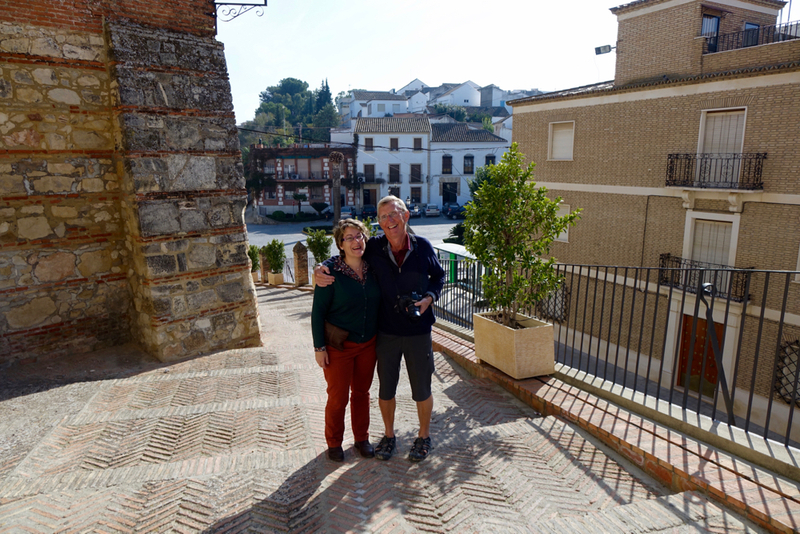 The site is run by Mathilde, originally from Madrid who came here aged seven when her parents started the campsite, and her husband Rik, from Holland. 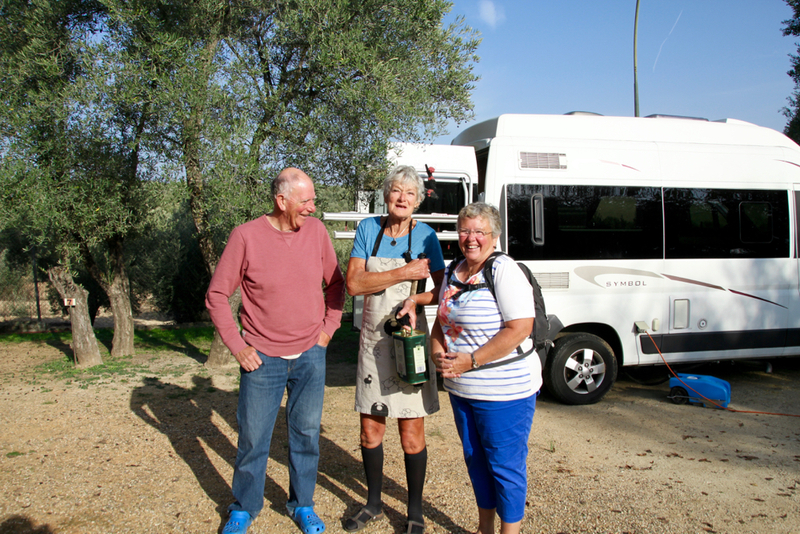 Malc and Carel, two fellow motorhomers and friends of Rik and Mathilde. The six of us shared home-cooked paella the day after we arrived. 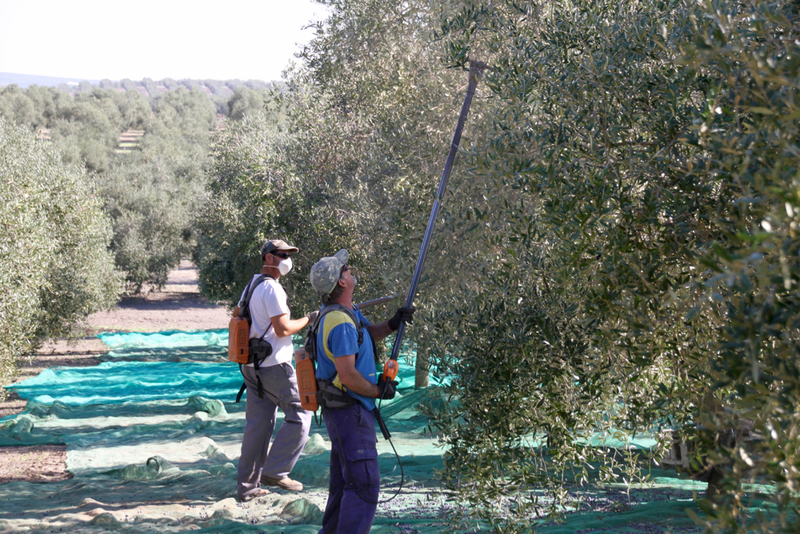 On Saturday we walked down in to the Olive Groves which surround the campsite to meet the olive pickers; after a dry few weeks the harvest has started. Black or green, they are all picked at the same time. 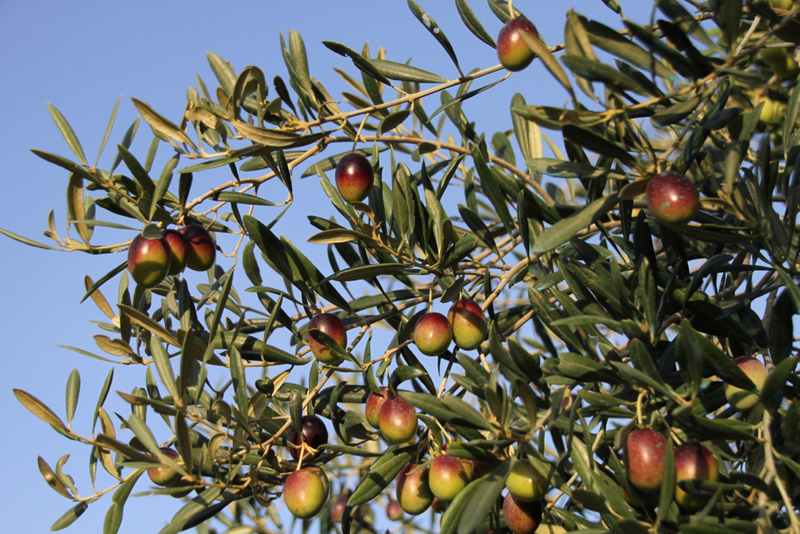 The fruit here goes to the local processing unit to be turned in to olive oil. 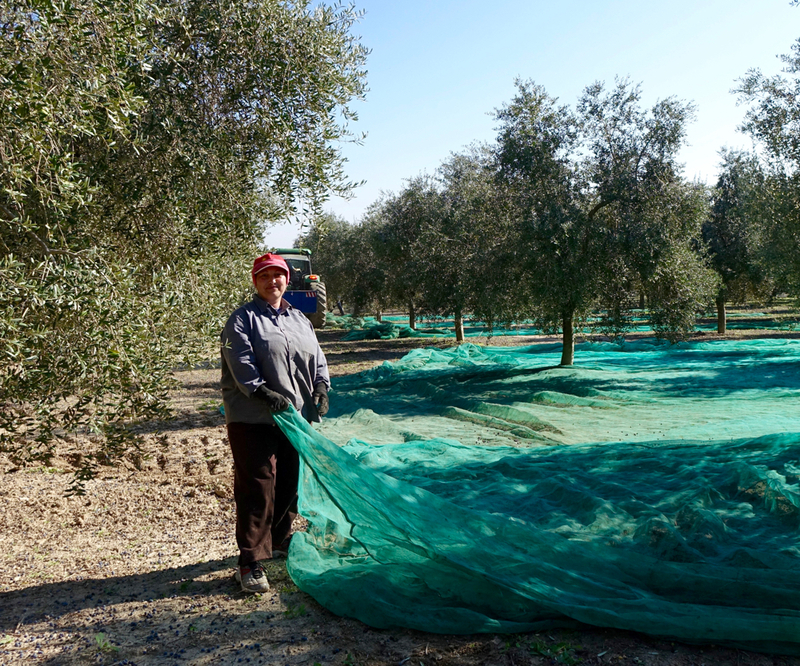 First the ground is covered in nets, then a tractor comes along with a tree shaking attachment (don’t see many of those in Cumbria) and shakes quite a lot of the olives on to the nets. 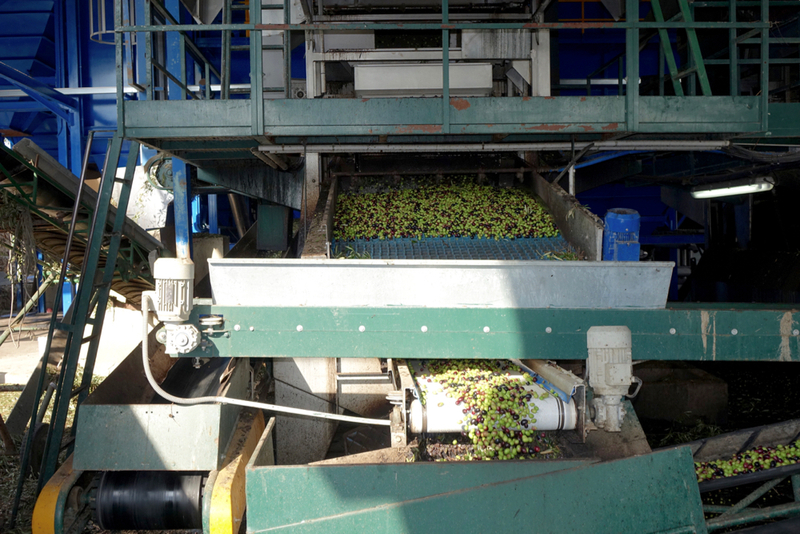 Then a team of men with electric forks…clever devices with reciprocating tines…strip out any fruit still attached. What a friendly bunch….as soon as we pitched up they formed up into a line for a photograph. 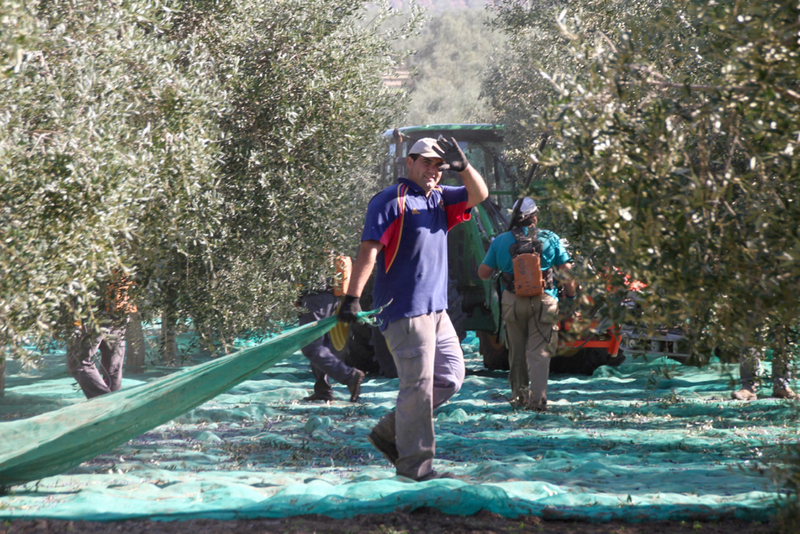 This guy picks up the nets and pulls the olives into a big hopper on the front of one of the tractors. 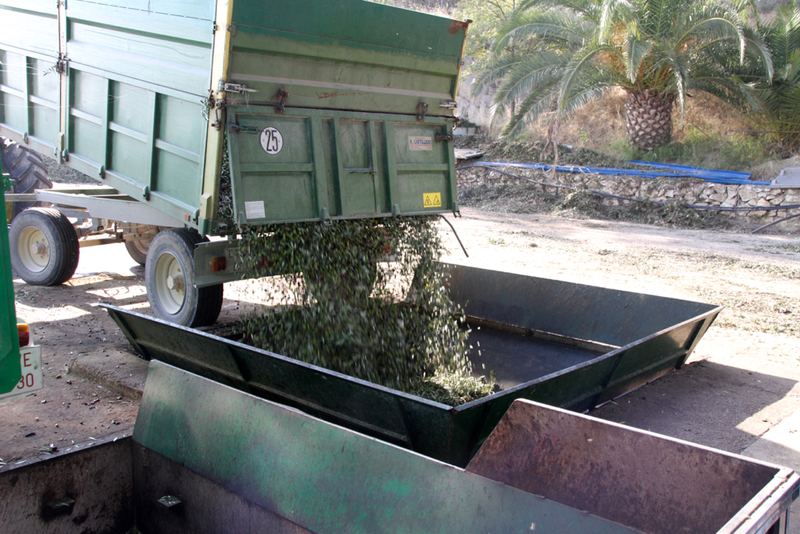 As soon as the hopper is full it gets decanted into a bigger trailer. 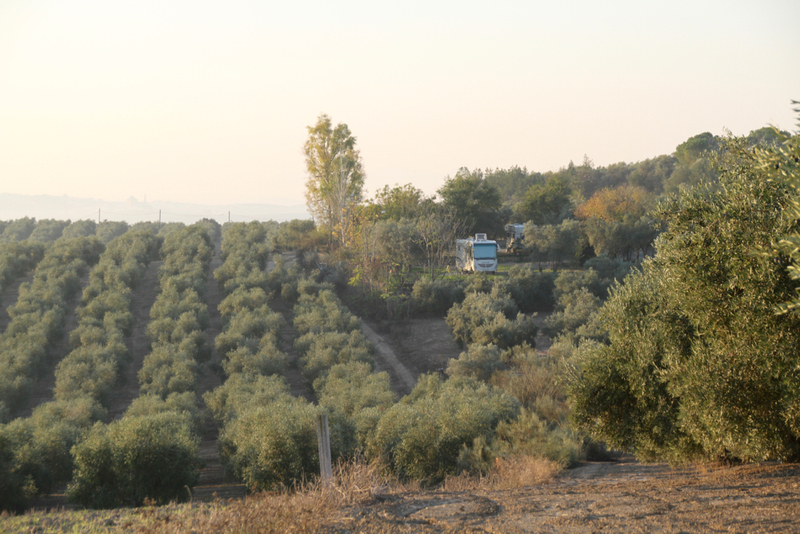 You will meet the olives again, a bit later in this post. 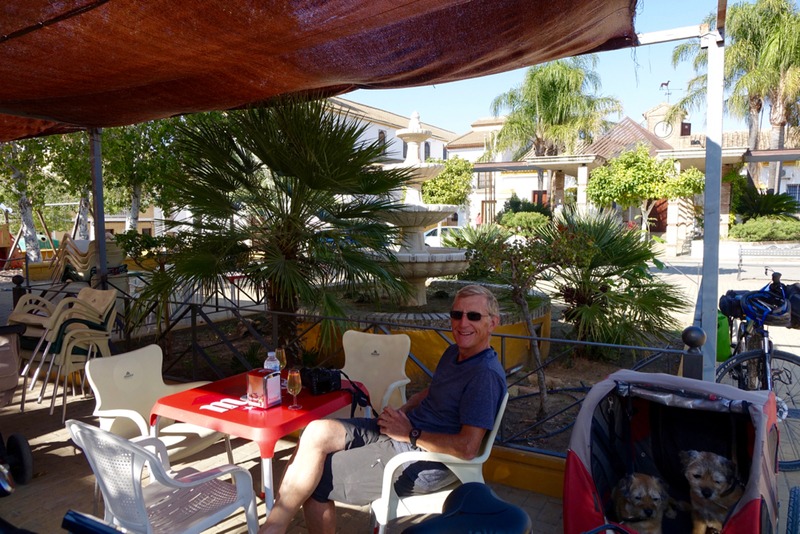 At the weekend, we cycled through the olives to San Sebastian de Los Ballesteros for wine and tapas. 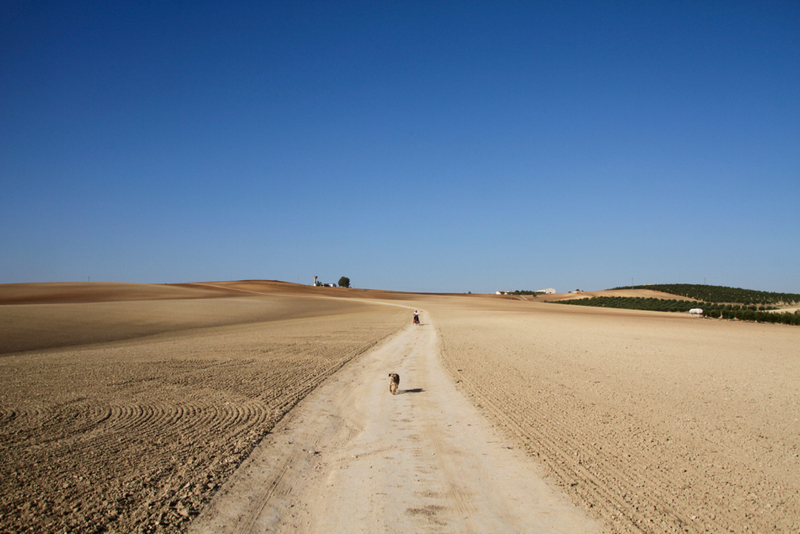 There has been a long dry spell and the farmers are waiting for rain before they plant for next year. 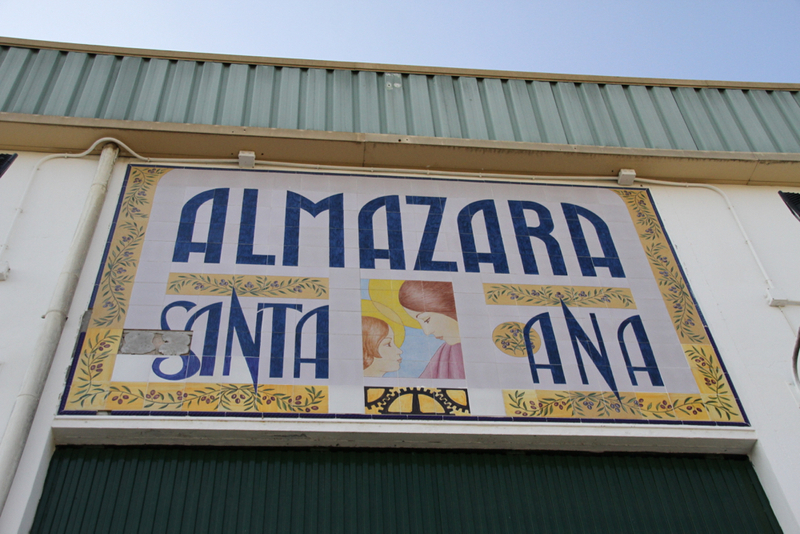 On Monday Mathilde drove us to Santaella, the quiet town close by, which has been the centre of this agricultural region for many centuries. 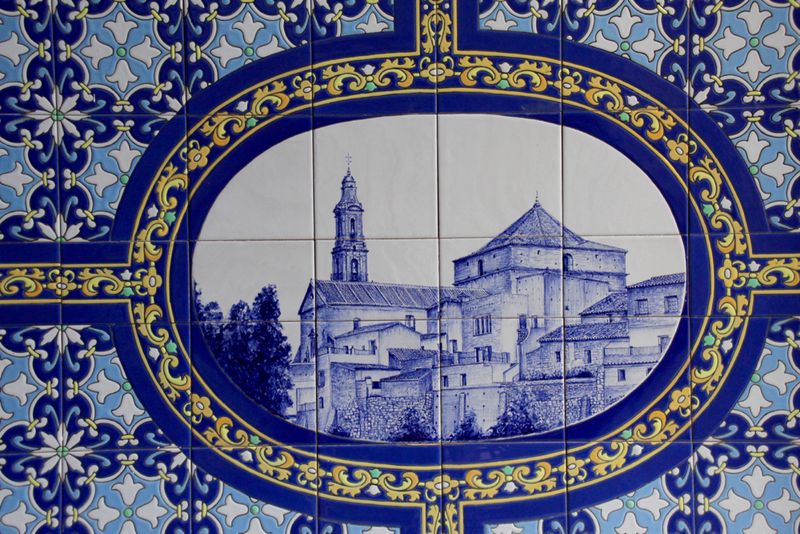 As with much of Andalucia the town was a Moorish settlement at the beginning of the last millennium. 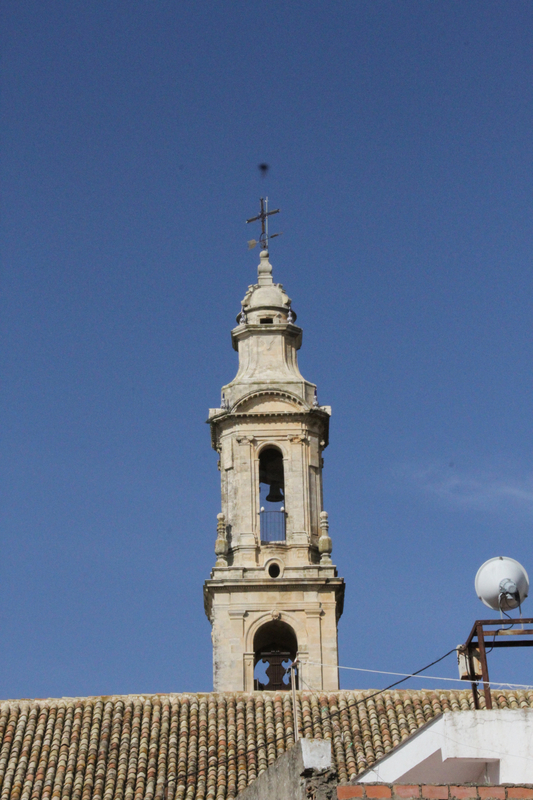 The minaret by the church at the top of the town marks the site of the old mosque. We looked round the church which was built around the mosque in the 1400’s. 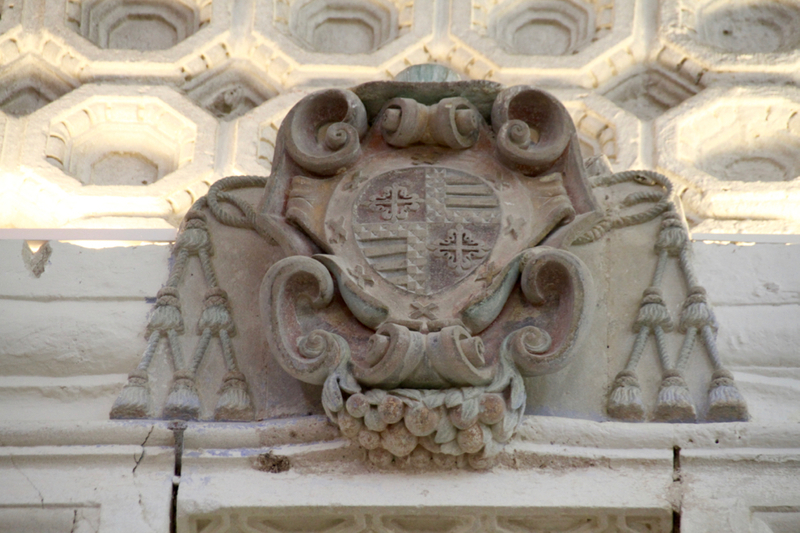 There are many different coats of arms around the church, each representing a different Bishop of Córdoba and reflecting the long time spent converting the architecture to a form which the catholics here would be comfortable with. 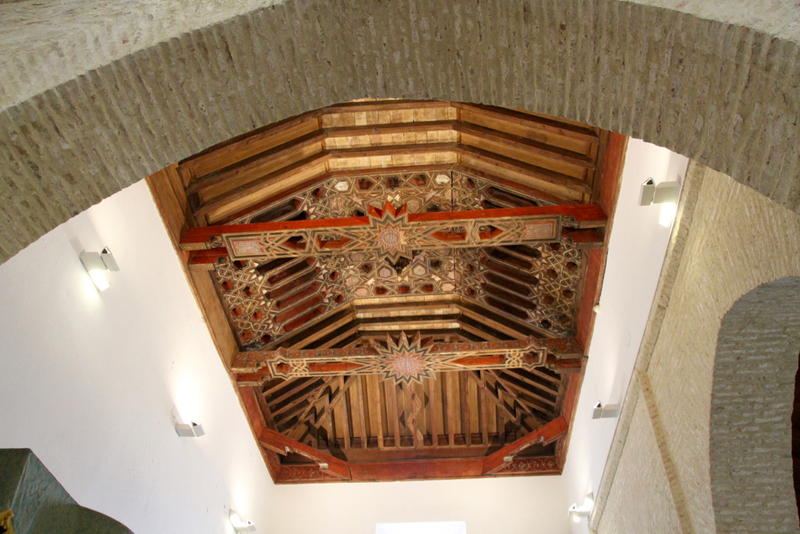 There is a very well preserved roof from Arabic times. 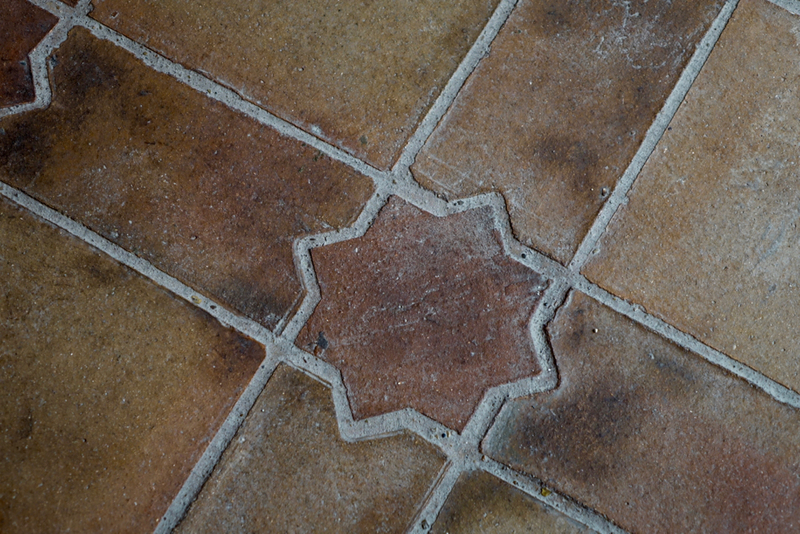 And much other evidence, such as this tiling in 8 pointed stars, of the Moorish origins of the building. 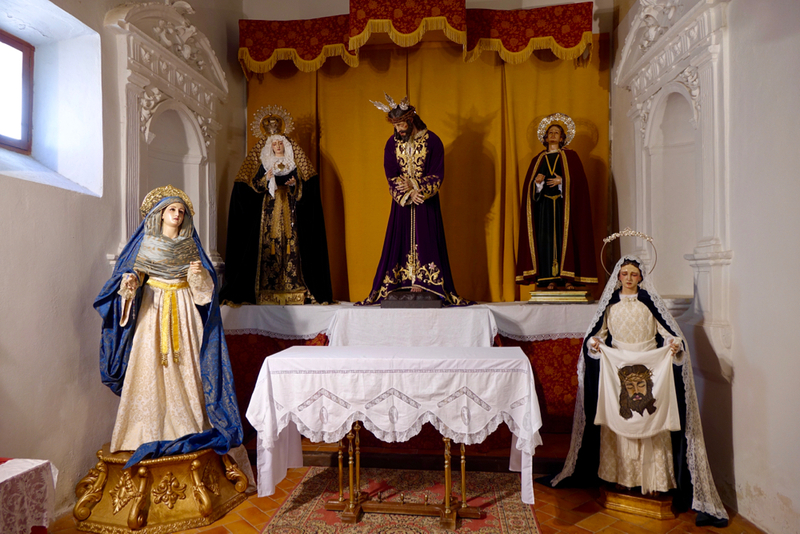 Every Easter there is a week of processions, and these figures of Jesus, Saint Mary and other saints are carried round the streets for all to see. 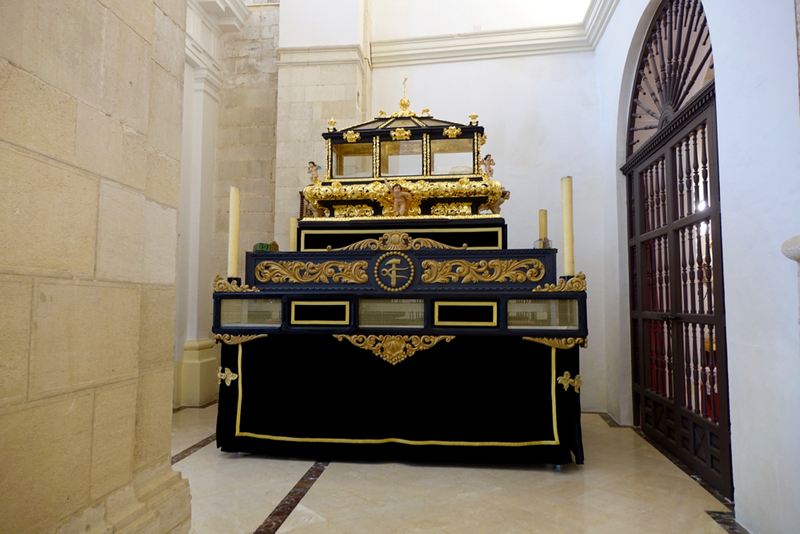 This is the ceremonial coffin, carried by 16 men under the covers, which carries the figure of Jesus on the Easter processions. 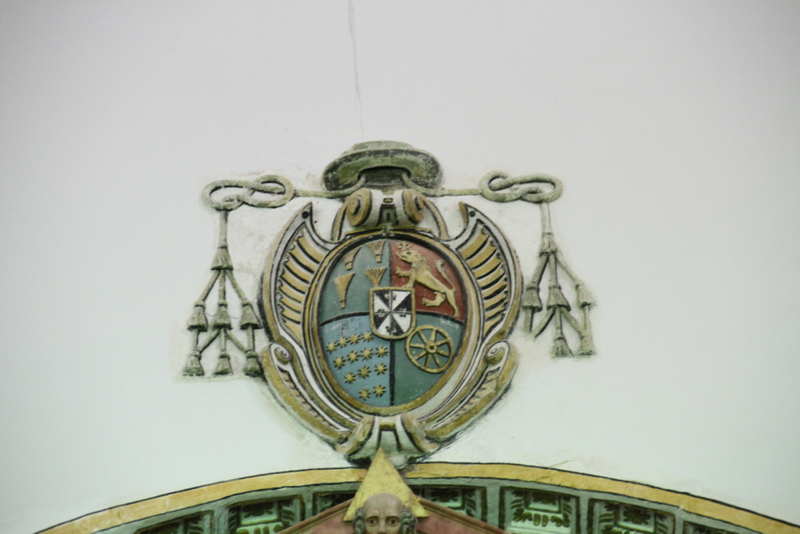 Apparently there is generally also a bottle of brandy or two, hidden beneath the draperies, to sustain the figure bearers. Mathilde took us on a tour around Santaella. It is now a cafe and we went in for coffee. 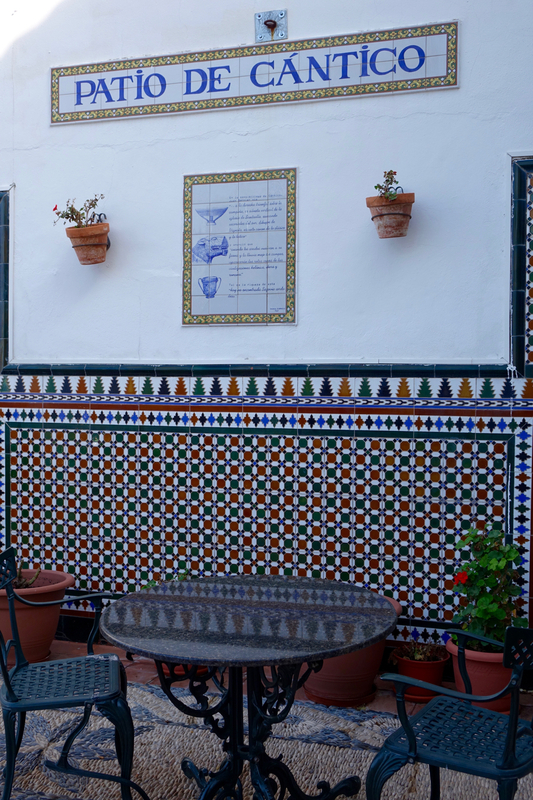 There is a terrace much decorated by ceramic pictures and poetry, supplied by a group of local artists and writers who used to meet here. 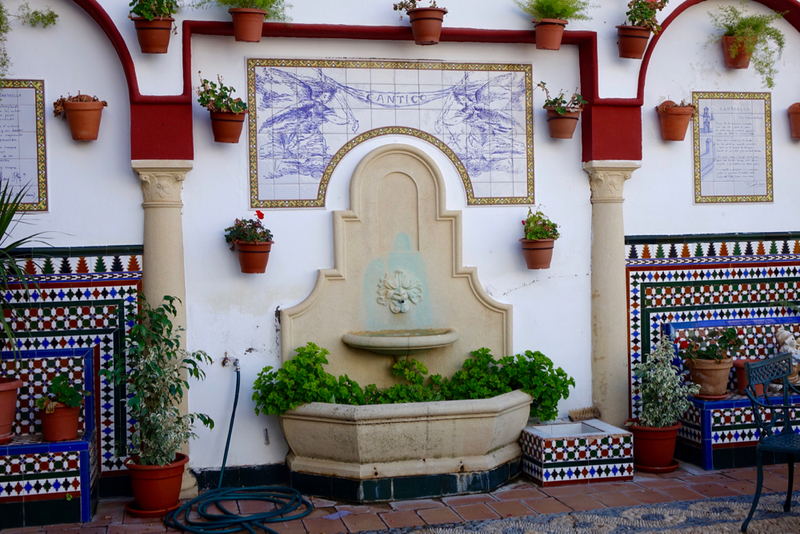 After Santaella, Mathilde took us to Montalbano de Córdoba. 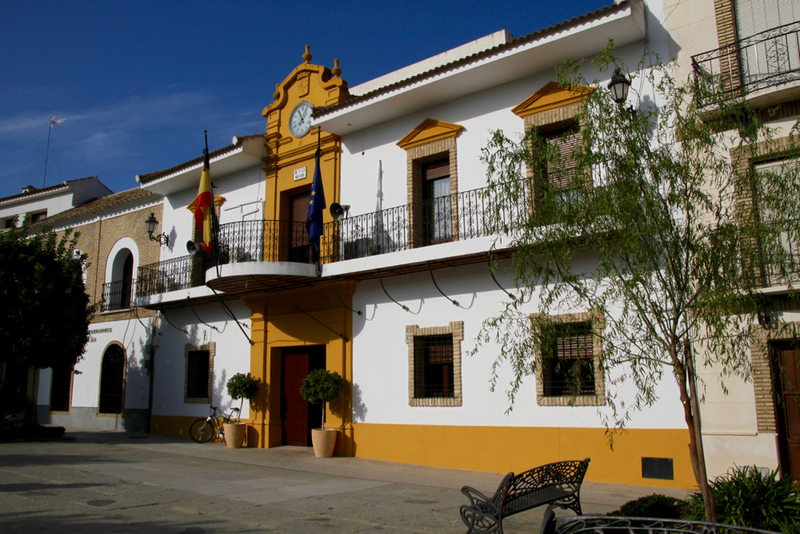 This is another small town, about 10 km from La Campiña. 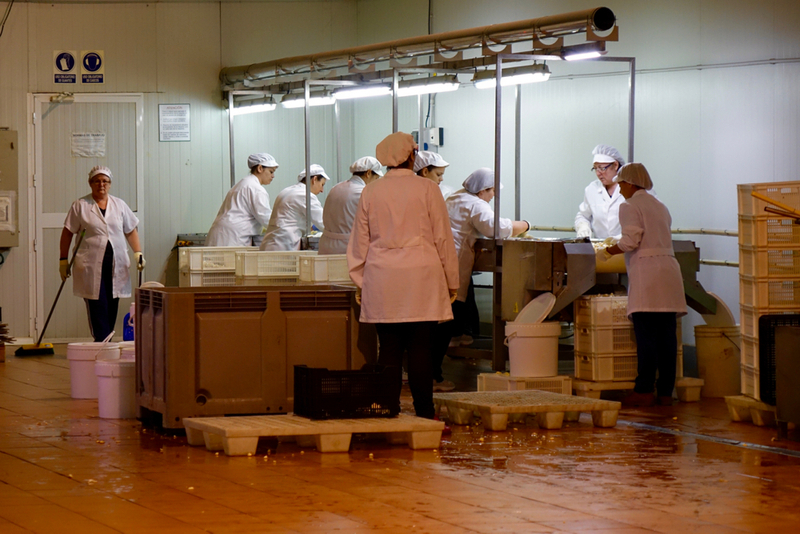 First stop was a quick look around a garlic processing plant, where we tasted black garlic…bulbs which have been heated enough to preserve them and produce a dark, crumbly texture. Delicious. 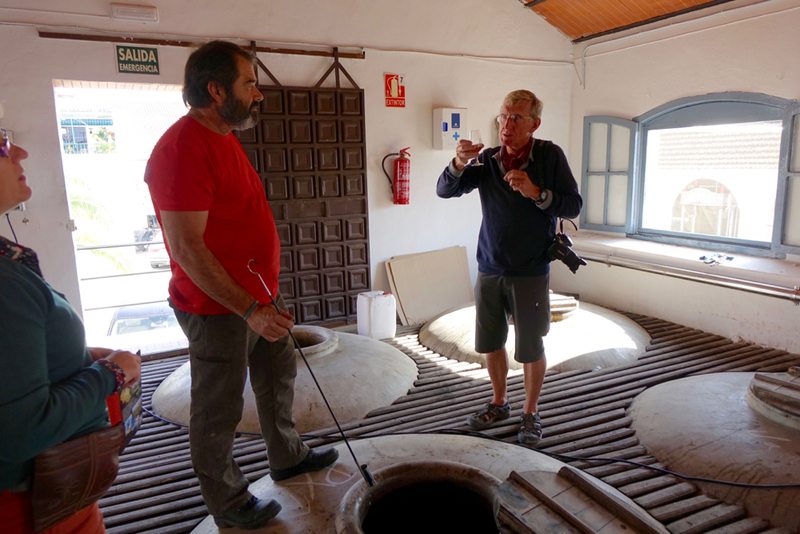 Next stop was the Bodegas del Pino in Montalban where they turn locally grown Pedro Ximenez grapes into a variety of delicious wines. 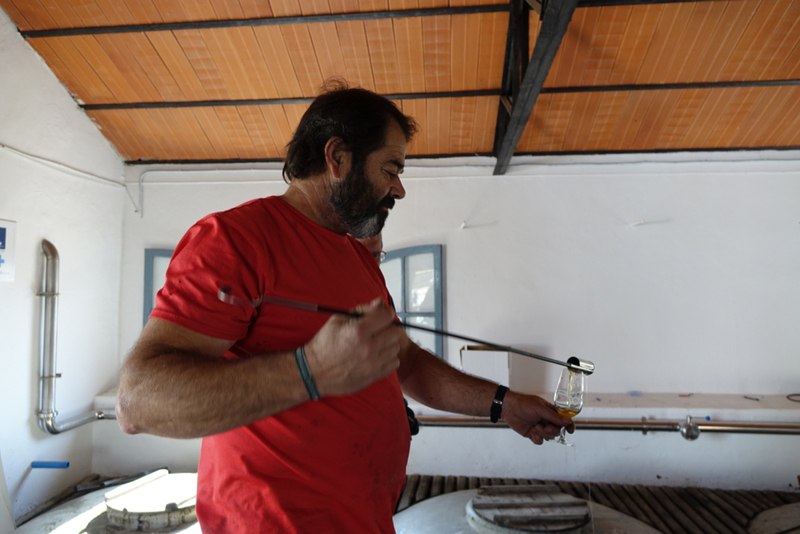 They make a sweet dessert wine here which is particularly nice. 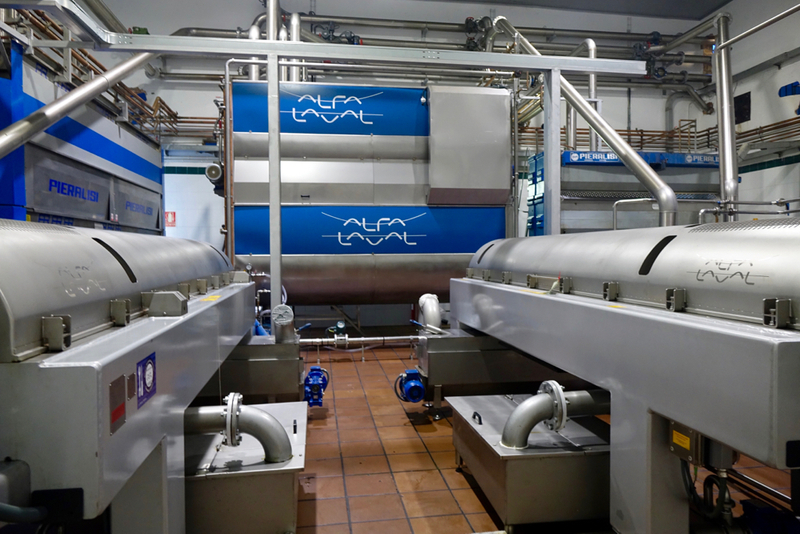 The picture above shows the old grape presses. We had to try some more…it would have been rude not to. 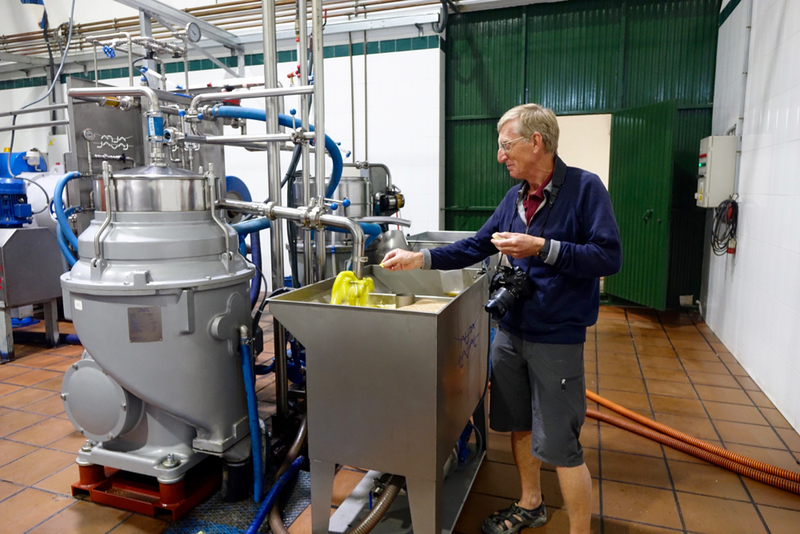 We moved on to an olive oil processing plant to see what happened to the olives we had seen picked a few days before. 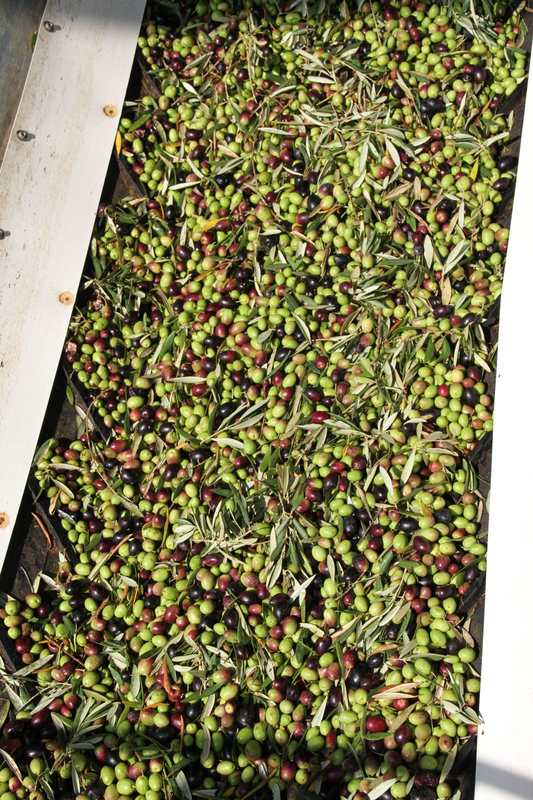 First the olives are tipped in to a big hopper. 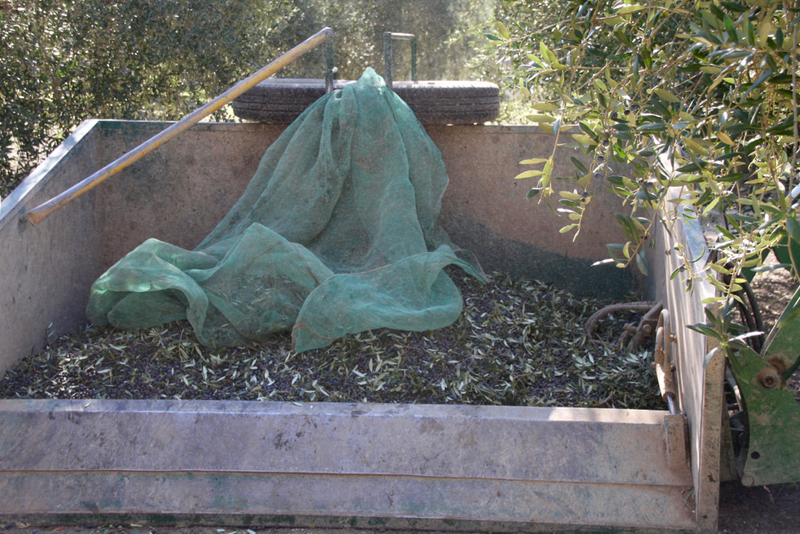 The olives are conveyor-belted up, blown (to remove the leaves ) then washed. 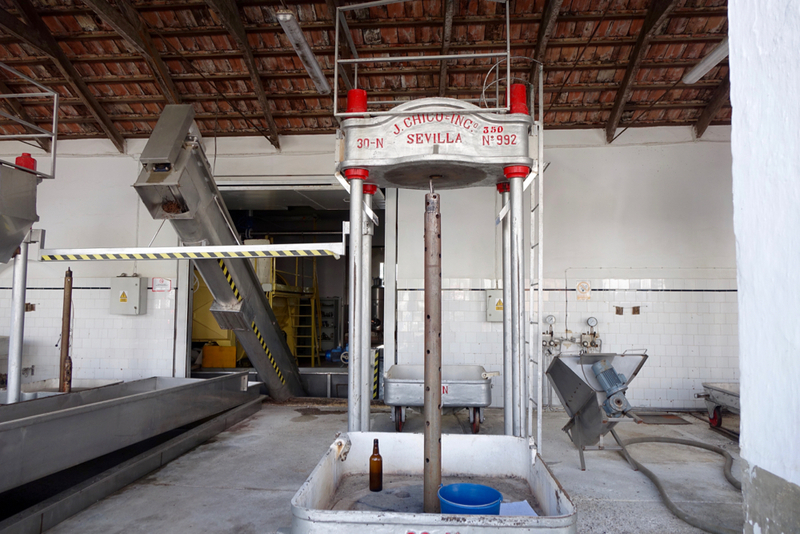 After crushing, the paste is centrifuged to separate out the oil. 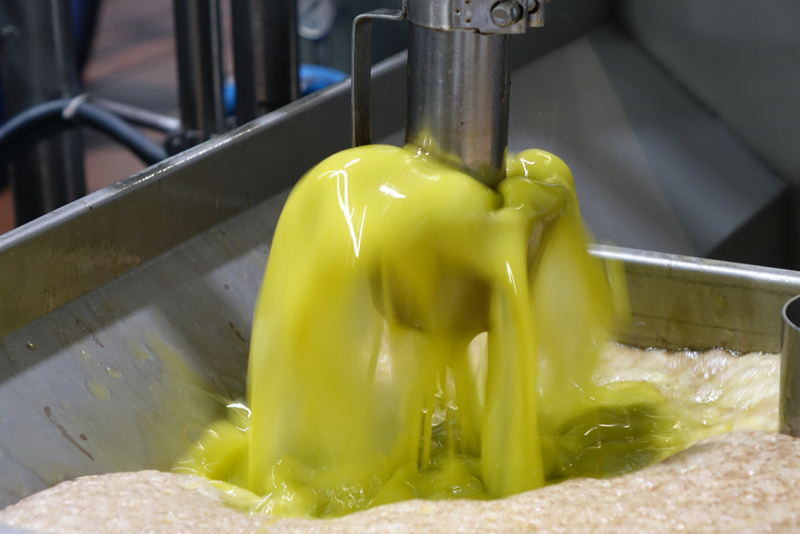 This is the end product; a lovely bubbling geyser of first press, milky, extra virgin olive oil. 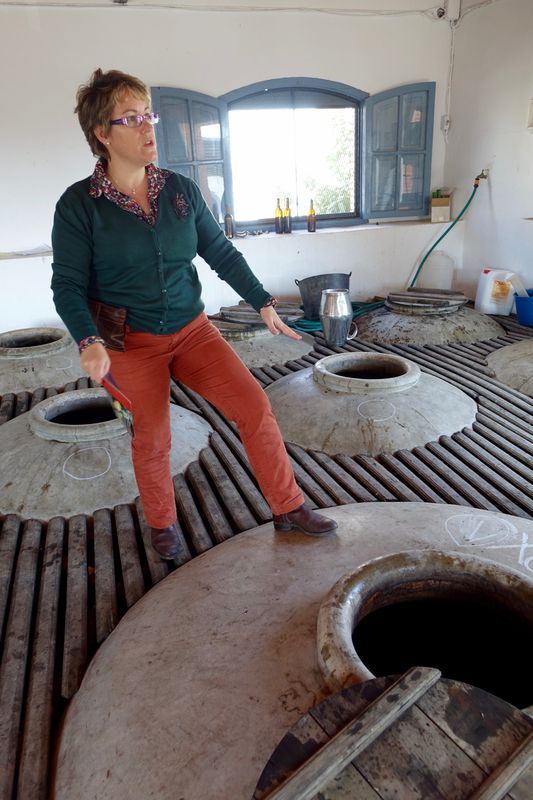 Mathilde had bought some bread and we dunked it in the fresh oil and scoffed away. Absolutely delicious. Fascinating and great pictures !!. 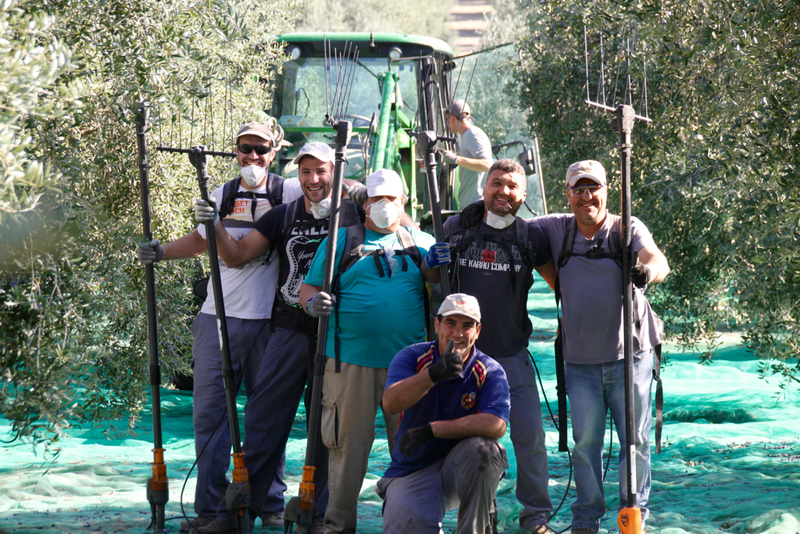 We just back from Croatia and found ourselves helping out with the olive harvest on a site we were staying at . 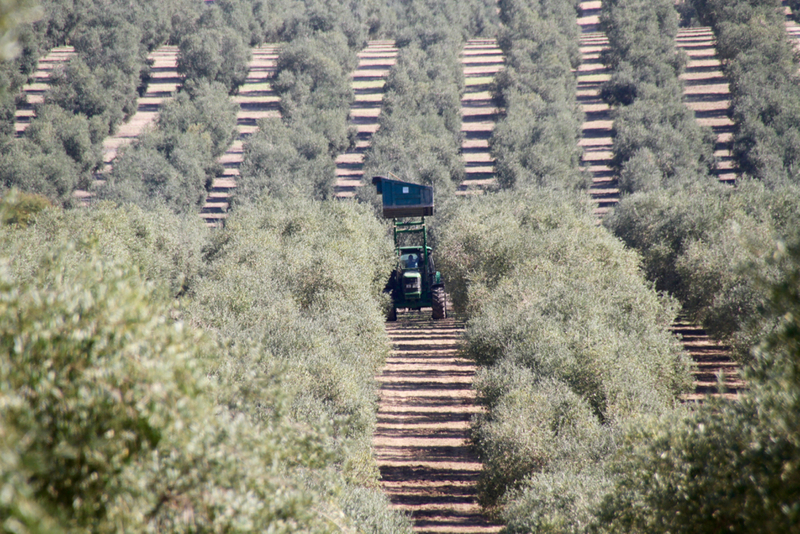 No tractors there so we handpicked the olives and enjoyed ourselves immensely. 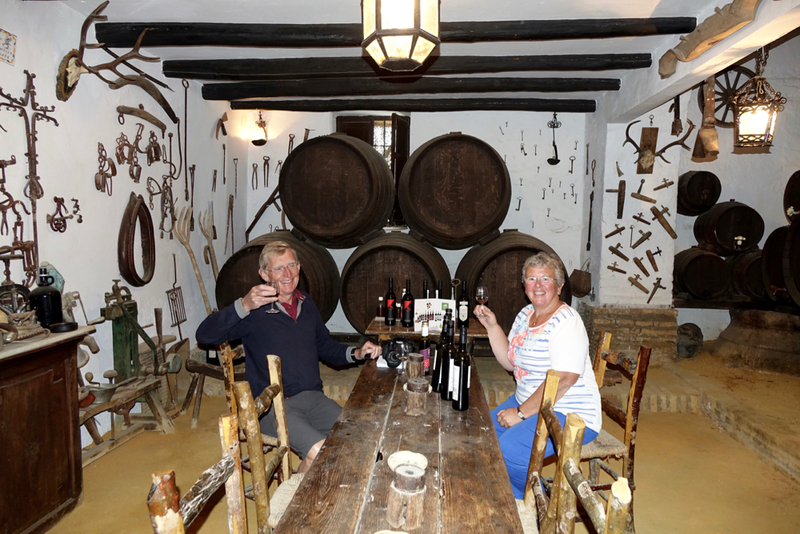 Our reward was a bottle of homemade pear schnapps which Susie thought tasted like paraffin . I thought it was ok . Keep up your blog . It brightens up a gloomy november day here . Lovely to hear from you again. 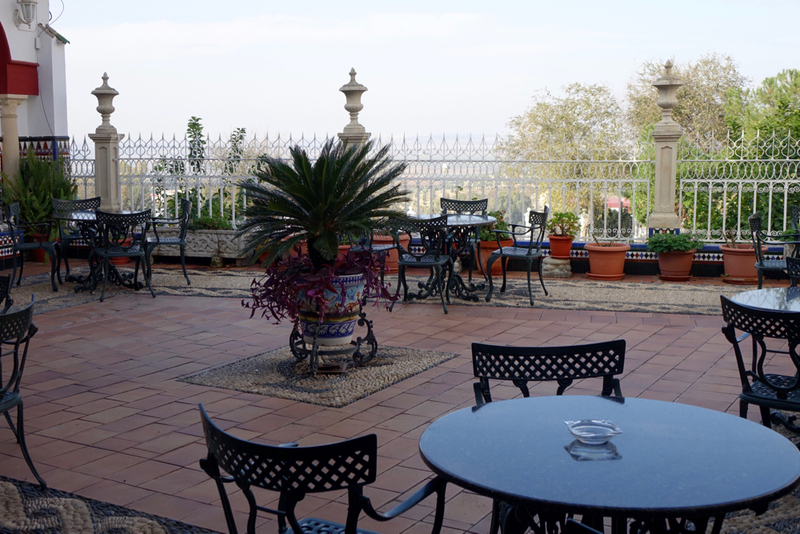 We will shortly be joining you in sunny UK!….we are back a few weeks before Christmas. Have you any plans for next year yet?